Electric storage water heaters use electrical resistance to raise the temperature of one or more heating elements mounted inside the water tank. These replaceable elements are categorized as low-density or high-density, based on their design. Before choosing new heating elements for your electric water heater, it's important to understand the differences between the two styles. Water heater elements should be checked regularly. When referring to water heater elements, "density" refers to the amount of wattage per square inch of surface area. As an example, a heater element with 10 square inches of surface area, rated for 1,500 watts, would conduct 150 watts per square inch when in use. By comparison, a 1,500 watt element with only 7.5 square inches of surface area would be a higher density element, conducting 200 watts per square inch. Low-density elements have more surface area than high-density elements with comparable wattage. 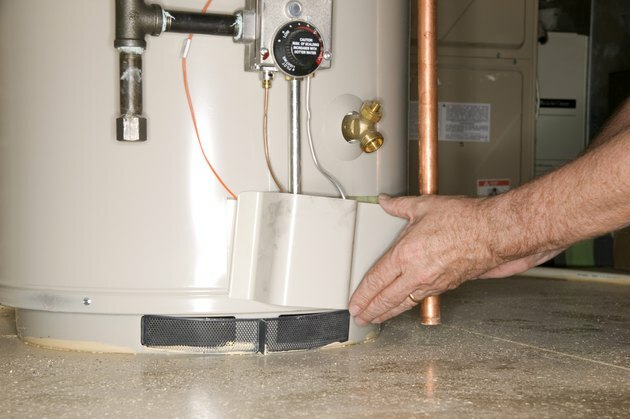 High-density water heater elements have a tube shaped like an extremely skinny, elongated letter "U" with the ends attached to a flange or threaded screw that mounts to the water heater tank. The element gets very hot because of the comparatively high level of wattage per square inch. This extreme heating, coupled with the tendency of high-density elements to attract a coating of limescale when exposed to hard water, make them relatively short-lived. Low-density elements incorporate more surface area within a similar volume by making the U-shaped tube longer and bending it back on itself to make a double loop. They do not produce as much heat per square inch as high-density elements, and attract limescale more slowly. Because limescale forms an insulating layer between the element and the water, this makes them more efficient over the long term. In addition to having a longer useful lifespan, they are not as noisy as high-density elements during heating cycles. With their longer useful life, quieter operation and greater efficiency, low-density water heater elements are a higher quality product than high-density elements. This quality comes with a higher price tag, but the cost of more frequent replacement with cheap, high-density elements over the life of the water heater must also be taken into account. Regardless of your decision, make sure to choose a replacement element with the same wattage rating and tank attachment as the original. What Is the Difference Between Low Density & High Density Heating Elements?